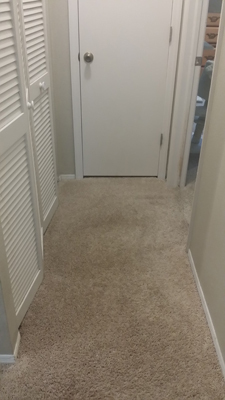 Here are a couple of before and after pictures of an upstairs hallway cleaning in Tampa FL. 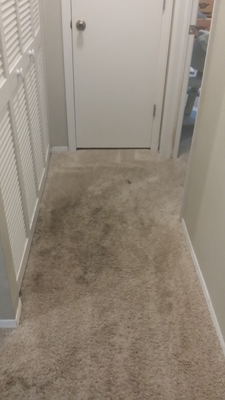 The carpet had not been cleaned in this rental for at least 3 years. The current resident was having it cleaned for the first time and was not sure if any of the stains could be removed. Behind the two doors to left of the photograph hide the washer and dryer. This meant that a lot of the spotting in the carpet was from washing machine soaps and detergents. How do soaps and detergents leave spots in carpeting. Great question. Soap and surfactant molecules have a dirt loving end and a water loving end. which is great if your pulling dirt out of something with soap and water, like a washing machine. But, if you spill laundry detergent on your carpet and you don't use enough water to remove it, the dirt loving end of the soap molecule will sit in the carpet and collect dirt. Here's the good news. We know how to remove soaps and detergents from your carpet. At Chem-Dry of Tampa FL we don't use soaps or detergents for carpet cleaning. We use a hot carbonated solution that rips dirt and left over detergents right out of your carpet. For a great carpet cleaning in Tampa FL call Chem-Dry of Tampa.